"Matt's marketing ideas and expertise fueled my off-season business to the point that I ended up turning some of that business away. Without his help, my business would not have been successful." - Elliot Johnson, Kansas City Royals Infielder. For over a decade, Matt DeMargel was responsible for the branding and marketing of America's Favorite Minor League Team, the Durham Bulls. Made famous by the hit movie, Bull Durham, the Bulls are one of the most recognized brands in all of sports. In that time, the Bulls set three attendance records and received several national recognitions, including the esteemed Bob Freitas award given at the annual Baseball Winter Meetings. DeMargel's innovative uses with Facebook grew the team's virtual fan base to the second highest total among minor league baseball in just under a year. 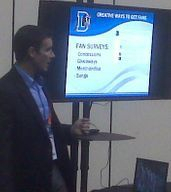 For his efforts he was asked to present his strategies to the baseball world at the Winter Meetings in 2009. Since 2013, DeMargel has worked with national franchise brands and small business owners such as Great Clips, Papa Murphy's Pizza, Fred Astaire Dance Studio, The Joint Chiropractic and Clothes Mentor to raise their brand awareness, generate leads and new business sales through publicity and content marketing. To contact DeMargel to help with your marketing efforts, click here.